(1) [sea ice] a smooth hill of ice that forms on the sea ice surface from eroding ridges, particularly during the summer melt; the formation of hummocks is similar to young mountain peaks with steep slopes that erode into smooth, rolling hills. (2) [frozen ground] Small lumps of soil pushed up by frost action, often found in uniformly spaced in large groups. 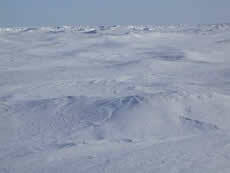 Hummocks can form in areas of permafrost or seasonally frozen ground, and are one of the most common surface features of the Arctic. [sea ice] pressure process by which floating ice becomes broken up into hummocks. a form of weathering that affects all rocks; water freezes in pores and cracks, which leads to an increase in specific volume (vol/unit mass) of the water, producing stress that is greater than the tensile strength of all common rocks; ultimately leads to shattering and fracturing of the rocks. the ratio of the hydraulic conductivity and the storage capacity of a groundwater aquifer. artificial thawing (and removal) of frozen ground by the use of a stream or jet of water under high pressure. a layer or body of cryotic (but unfrozen) ground in a permafrost area, maintained by moving mineralized groundwater. any product of condensation or sublimation of atmospheric vapor, whether formed in free atmosphere or at the earth's surface; also any water particles blown by the wind from the earth's surface. 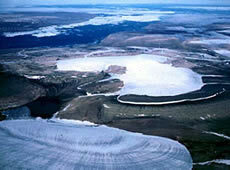 a layer or body of noncryotic unfrozen ground in a permafrost area, maintained by moving groundwater. an instrument which measures the water vapor content in the atmosphere; there are several different means of transduction used in measuring this quantity and hence various types of hygrometers; these are: a) the psychrometer, which utilizes the thermodynamic method; b) the class of instruments which depends upon a change of physical dimension due to absorption of moisture (hair hygrometer, for example); c) those which depend upon condensation of moisture (dew point hygrometer); d) the class of instruments which depend upon the change of chemical or electrical properties due to absorption of moisture, and some others. the solid crystalline form of water. a mass of ice adhering to a mountainside. white glare on the underside of low clouds indicating presence of ice which may be beyond the range of vision. a floe smaller than 20 meters (66 feet) across. pack ice from the point of view of the submariner. a dome-shaped mass of glacier ice that spreads out in all directions; an ice cap is usually larger than an icefield but less than 50,000 square-kilometers (12 million acres). 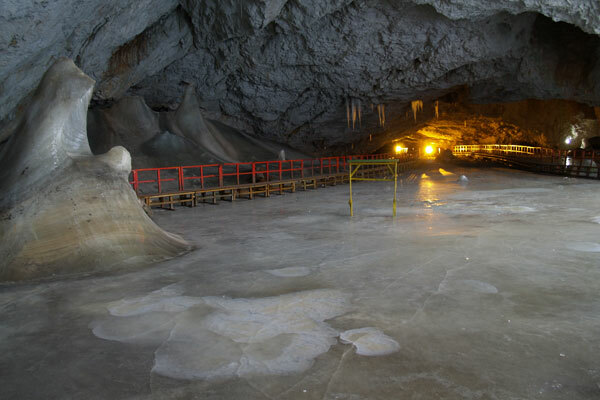 a natural bedrock cave that contains year-round ice. a concentration of sea ice, covering 100's of square kilometers, which is found in the same region every summer. the fraction of an area that is covered by sea ice. a core sample drilled from the accumulation of snow and ice over many years that have recrystallized and have trapped air bubbles from previous time periods, the composition of which can be used to reconstruct past climates and climate change; typically removed from an ice sheet (Antarctica and Greenland) or from high mountain glaciers elsewhere. land overlaid at present by a glacier is said to be covered; the alternative term glacierized has not found general favour. the boundary separating opposing flow directions of ice on a glacier or ice sheet. the total area covered by some amount of ice, including open water between ice floes; ice extent is typically reported in square kilometers. a suspension of numerous minute ice crystals in the air, reducing visibility at the earth's surface; the crystals often glitter in the sunshine; ice fog produces optical phenomena such as luminous pillars and small haloes. the vertical cliff forming the seaward face of an ice shelf or other floating glacier, varying in height from 2 to 50 meters (2.2 to 55 yards) above sea level. A column of ice in the granular snow at the top of a glacier. 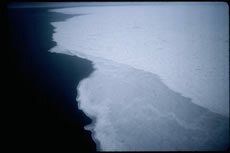 a form of tabular berg found in the Arctic Ocean, with a thickness of 30 - 50 meters (33 to 55 yards) and an area from a few thousand square meters to 500 square kilometers (123,550 acres); ice islands often have an undulating surface, which gives them a ribbed appearance from the air. an accumulation of broken river or sea ice caught in a narrow channel. from the point of view of the submariner, a downward-projecting ridge on the underside of the ice canopy; the counterpart of a ridge; ice keels may extend as much as 50 meters (55 yards) below sea level. a dominantly horizontal, lens-shaped body of ice of any dimension. the average position of the ice edge in any given month or period based on observations over a number of years. a research ship which performs ice surveys in polar regions.